This Navratri, celebrate Devi in her many manifestations – Durga, Lakshmi, and Saraswati – with the newest musical release from Sadhguru and Sounds of Isha. Triveni, the newest offering from Sounds of Isha and Sadhguru, has been released just in time for Navratri, and has already reached the #3 ranking on iTunes India! Below, read about the inspiration for the album, and watch the newly released video for “Bhairavi Prarthana”, chanted by Sadhguru. 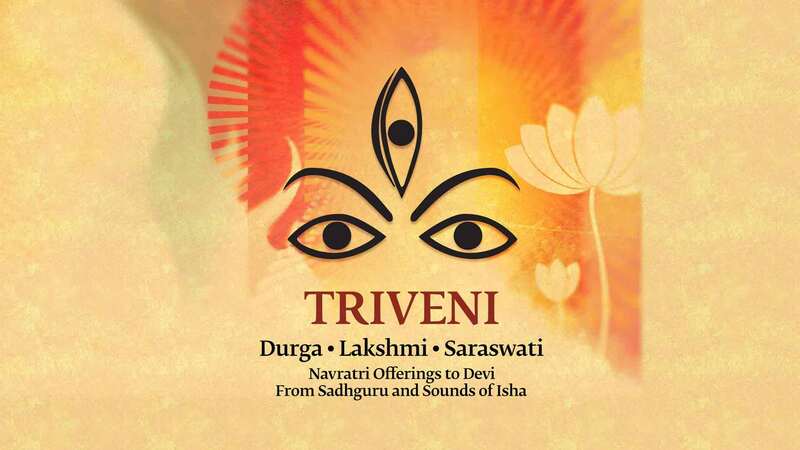 Triveni or “three rivers” celebrates the three predominant aspects of the Devi – Durga, Lakshmi and Saraswati. During Navratri, a festival dedicated to the Divine feminine, Devi manifests in her many forms. The first three days represent the quality of tamas, where the Goddess is fierce like Durga. The second three days are rajas, for the materially-oriented Lakshmi. And the last three days are sattva in nature, dedicated to Saraswati, the Goddess of knowledge and transcendence. On the tenth day, Navratri culminates into Vijayadashami, a day of victory over darkness. The album is a collection of 10 songs of varying genres depicting the different forms manifested by Devi during the Navratri time. There are a total of 7 chants and 3 songs composed by Sounds of Isha to the most revered works of Shri Adi Shankara, Kalidasa, Subramani Bharathi and others. These songs, dedicated to the three different forms of Durga, Lakshmi and Saraswati, represent the qualities of fierceness, vibrance and subtleness, revealing the essence of Navratri in a musical way. Many volunteers have offered their time and artistic talents to bring this album to fruition. Sounds of Isha wishes to acknowledge Yashita Sharma and Sameer Rao for their significant contributions. Chanted by Sadhguru, this verse extols the many qualities of Linga Bhairavi. She is the consort of Shiva, the embodiment of Yoga, and the one who is blissful, fierce and compassionate. Bhairavi Shatakam is adapted from the writings of Adi Shankara, one of the greatest philosophers of India. The beautiful verses describe the infinite qualities of the Devi. In her ferocious form, Devi slays demons and wears a garland of skulls. In other forms, she bestows blessings in this life and beyond. Bhairavi Vandana appeals to Linga Bhairavi for protection and liberation, as she is the one who nourishes and is endowed with all powers. Devi Dasa Shloka Stuti was penned by Kalidasa, one of the greatest Sanskrit poets of India. In his characteristically beautiful poetry, he offers his obeisance to Devi and expresses his longing to be at her feet. Prata Stuve Para Shivam Bhairavi praises Devi as the Goddess of words and language. This chant was written by Adi Shankara. Jaago Bhairavi is an invocation of Linga Bhairavi. The devotee longs for Devi to awaken in her heart, to be taken across the ocean of life, and to surrender at Devi’s feet. Devi is extolled as the one who destroys the sorrow of those who surrender to her, who cures the darkness created by ignorance and who grants purity to our wisdom. Chanted by Sadhguru, this powerful verse commemorates a sacred beginning and a new path into the world of knowledge and arts. An appeal to the Goddess Saraswati, it is often chanted on Vijayadashami, the day of victory over ignorance. At Linga Bhairavi, Vidyarambham is one of several rituals offered daily to assist a child’s growth and wellbeing.